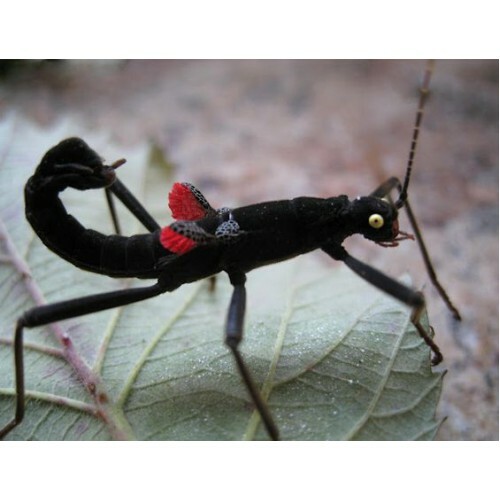 These Peruvian stick insects have a very striking appearance. Their velvety black body and bright hind wings give this insect an attitude. This is all counteracted due to the fact it looks like it has put on lip stick...badly. They use their rear wings to fend off predators by flashing their bright red colour at them. Black Beauties also have the ability to squirt an irritating liquid from glands in their head, this makes them less perfect for handling. They feed readily on privet and honeysuckle.